"The hands of future Hall of Famer Omar Vizquel and the energy of Dustin Pedroia" - Cursed To First - Sox and Pats forever. 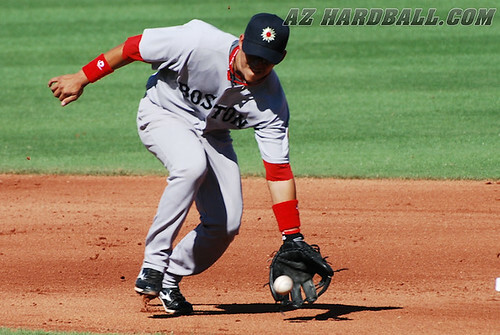 "The hands of future Hall of Famer Omar Vizquel and the energy of Dustin Pedroia"
Jose Iglesias Fields a Grounder, originally uploaded by AZHardball. "This kid wants to learn everything," said Boston's Minor League hitting instructor Victor Rodriguez. "Some kids go out at night, he shows up at coaches' houses and wants to talk baseball. He's the first one at the park and the last to leave. He's nonstop." Iglesias, an MLB.com Top 50 Prospect, now speaks nearly flawless English, just six months after his signing. "His talent is obvious," said manager Terry Francona. "But this is a kid who wants to do the right thing, wants to learn, listens to everyone." And onto whom has he latched? One day last week, Pedroia walked up to Iglesias in the clubhouse and invited him to come to his house for a cookout and meet the family. Another day, Pedroia thought Iglesias didn't do one drill correctly. "Listen," screamed Pedroia, "you're a Red Sox [player]. Here, I'm Fidel Castro, and you're doing what I tell you." Iglesias' cousin is Yulieski Gourriel, who impressed at the 2006 and '09 World Baseball Classics and is considered the best player in Cuba (he was also Kendry Morales' roommate at a Cuban sports academy). Someone told Pedroia that the Red Sox were signing Gourriel and that since he's a second baseman, Pedroia would have to switch positions. Iglesias was doubled up laughing. "I'll have you both on boats back to Cuba," Pedroia yelled. Iglesias laughed. Then they hugged. "I've never met anyone like Petey," said Iglesias. "I love him. He is my big brother." After a couple of weeks in camp, Red Sox officials are convinced that Iglesias has such balance at the plate that he is going to hit, and that he will develop gap power. His plate discipline will improve. "Jose loves the game, and he takes in everything," said Pedroia. "He is really smart. Baseball is only about winning, and he's going to help us win someday." "I tell my family, 'I love it here,'" said Iglesias. "I want to win for the Red Sox, and I am going to be an American. I just want everyone to meet Dustin Pedroia." Sounds almost too good to be true. But maybe just maybe we finally have found a long term SS!